Mouse House, Inc. moved to our present location Thanksgiving weekend, 1994. 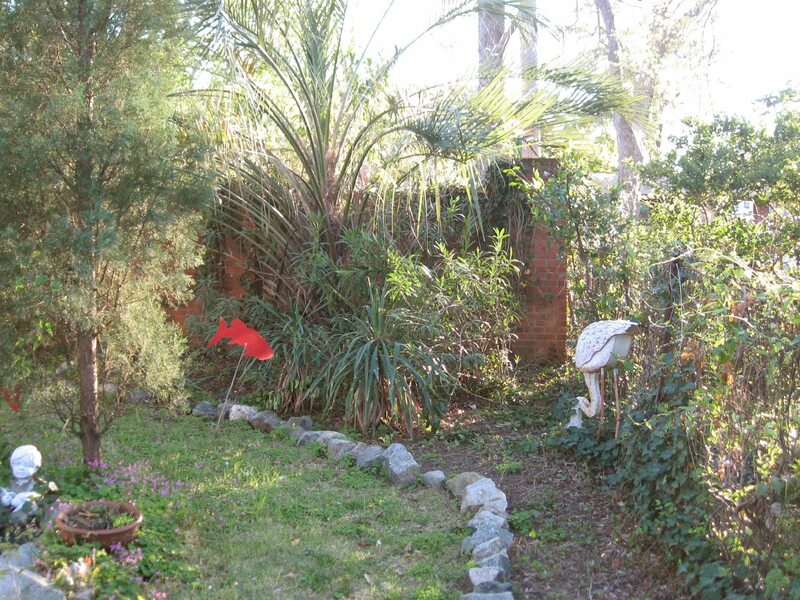 The backyard area was overrun with weeds and an old and poorly maintained asphalt parking lot. Quite honestly it was a jungle back there. One of the first things we did (after the garage was built in January, 1995) was to replace the asphalt parking lot with a nice cement one which has held up very nicely over the years. The second thing we did was to contract Woodley Garden Center to do some rudimentary landscaping. 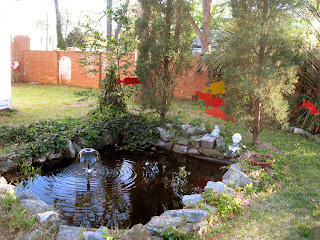 One of the things they did was to plant a few small dogwood trees to replace the overgrowth of weeds, as well as a few azaleas, bushes, and other assorted plants. 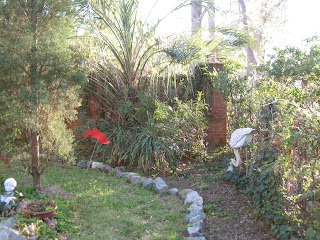 The palm tree has flourished very well and the oleander blooms every June. We added an 8ft by 10 ft by 15 in. pond later that summer which is still as beautiful and relaxing as ever with an assortment of multi-generational gold fish and the occasional bull frog. It is completely self-supporting, although I occasionally feed the fish. Last Sunday I noticed that one of the dogwood trees had no blossoms or buds. Upon further inspection and pruning it was quite apparent that the poor dogwood did not survive the winter. I removed all the limbs and cut the barren tree down with a hand saw. 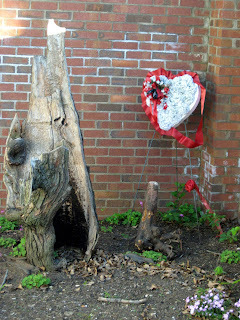 What remained was a one ft stub of a tree. After excavating the soil around the root system and using a sledge hammer I was able to remove the root ball of the dogwood. 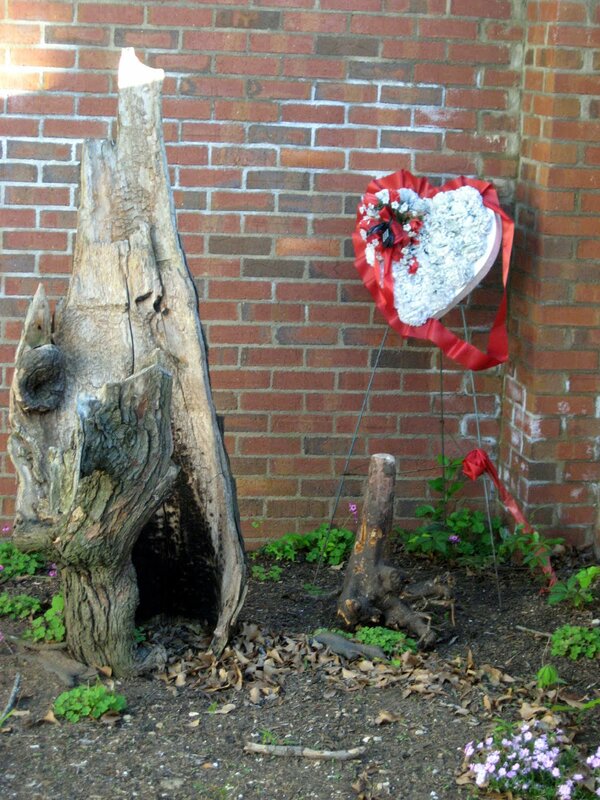 It now stands proudly with the tree stump which marks Siren's grave. The remains of Blackie, our former black cat, are buried nearby. Now for some other news, the moving out of Terrace Oaks Antique Mall in Charleston sale is going strong. There are some real bargains to be found. The sale will end on May 3. 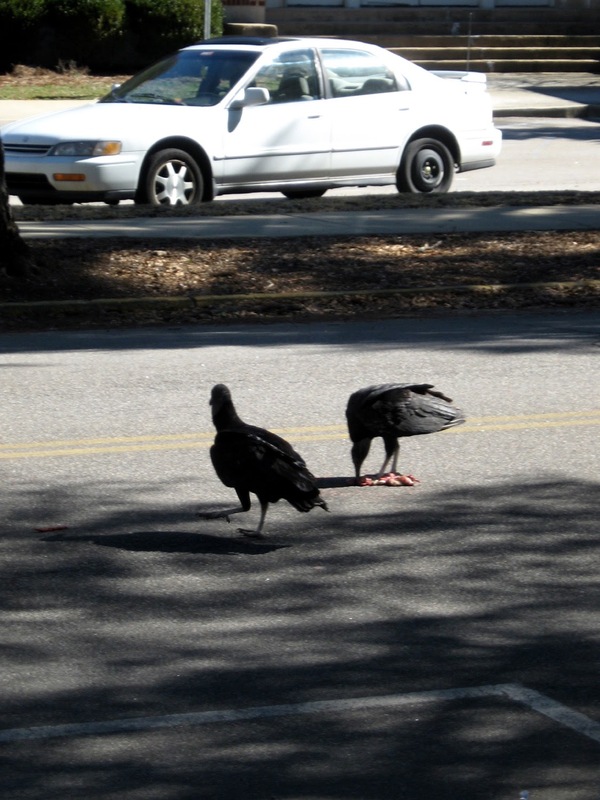 A pair or vultures (buzzards) in front of The Mouse House.